Each year, over six million people suffer a fractured, or broken, bone. Of those six million, about 300,000 people will need surgery to heal their bone fractures. If the surgery is not performed successfully and treatment fails, a fractured bone could become a crippling disability. With so much at stake, you don’t want an inexperienced surgeon in Los Angeles performing your operation. At Meier Orthopedic Sports and Regenerative Medicine, our Los Angeles orthopedic surgeons regularly perform surgery to repair fractured bones. We possess the experience to help make sure that your surgery is successful. Contact us at 310.736.2793 to talk to a doctor about your injury. The human body is an amazing thing. When a broken bone occurs, your body begins a process that ultimately could result in healing itself completely, and all the action takes place at a microscopic level. When a bone is broken, blood vessels are also damaged or broken. This results in bleeding around the area of the fracture. This alerts nearby tissue to begin growing new blood vessels and cells in the area. As this process progresses, cells begin to form cartilage, bone, and fibrous tissue. This is in essence how the body heals a broken bone. Most of the time, this is exactly what happens when someone breaks a bone. Unfortunately, some types of bone fractures cannot heal or align themselves properly alone. 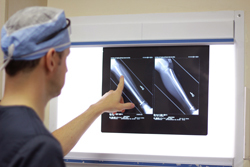 When surgical intervention must take place, our orthopedic surgeons are here to help. The break is severe or displaced, and needs to be fixed urgently in order to restore proper function. Non-surgical treatments are ineffective or likely to fail. Complications of conservative treatment could cause treatment to fail or cause other problems for the patient. Orthopedic services and sports medicine is constantly working to improve itself. Luckily, today’s orthopedic surgeons have a lot of tools in their arsenal when it comes to surgical repair of fractures. Thanks to ongoing research and clinical trials as well as the development of strong materials that our bodies can also tolerate, our orthopedic surgeons perform advanced surgeries that can now more successfully restore damaged bones to their original orientation and strength. In addition to regular surgery, Dr. Meier and his team perform clinical trials and research as well to improve patient care in the future and also provide state-of-the-art treatments for our patients in the present. Our surgeons may sometimes use bone grafting techniques during fracture surgeries, and other times metal implants (screws, pins, and plates) can be utilized to support the bone. However, even after surgery to fix a fracture, great care needs to be taken by the patient not to put too much stress on the fracture site. Metals can fatigue, or break down over time, no matter how strong they are – the metal is usually only present to keep the broken bone in proper alignment and positioning so that new bone matrix may grow and heal itself together. Bone fractures also may carry a high risk of infection. Compound fractures (when bone breaks through the skin) are particularly vulnerable to infection, as the skin can no longer shield it from outside bacteria and other microbes that cause infection. In these cases, surgery is almost always necessary to reposition the broken pieces of bone back together properly, and thoroughly cleanse the area to minimize chances of serious infection. Learn more about bone fractures at WebMD.com. The orthopedic surgeons at Meier Orthopedic and Sports Medicine are experts in surgical repair of fractures. Our highly qualified doctors and support staff possess the knowledge and experience to treat your injuries well and get you to full health, or as close as is possible considering your condition. Never settle for anything less than the highest quality in orthopedic care! 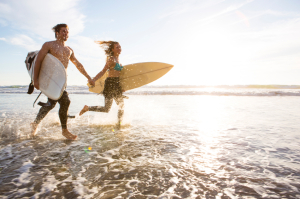 If you have suffered a broken bone, contact our surgeons in Los Angeles today at 310.736.2793 to schedule an appointment for consultation, and let us help you get better!